Dr. Debowsky was born and grew up in St. Petersburg, Florida. He attended both Undergraduate and Dental School in a special Combined Degree program at the University of Missouri-Kansas City. Upon graduation, Dr. Debowsky served in the U.S. Air Force Dental Corps for five years, during which he completed a one year Advanced Education Program for General Dentistry. While on active duty, Dr. Debowsky was stationed at Andrews/Bolling Air Force Base in Washington, D.C., Incirlik Air Force Base in Turkey, and finally at Charleston Air Force Base in South Carolina. During his Air Force career, Dr. Debowsky was able to develop a wide range of surgical, endodontic, and special restorative Dental skills. After leaving Charleston, Bryan chose to settle in Tucker with his wife Michelle, their young son and daughter, and a hound dog named Rosie. 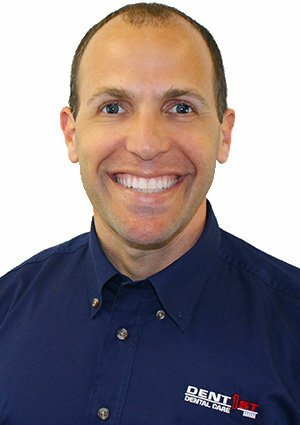 Dr. Debowsky is an avid soccer player (ask him about his Air Force soccer experiences) and enjoys playing and following many sports as well as traveling. He has also recently added Amateur Radio to his list of hobbies!Dr. Debowsky joined the DentFirst family in 2005 and patients can visit him at our Johns Creek, McDonough, Stonecrest, and Norcross locations.